I was born in 1956 in the heard of the Palatinate Forest, where I grew up between loggers and papermakers. I only had one wish for confirmation - a guitar. But as I was so bad in school at this time, my father told me : " You get no guitar, you get a desk instead and you have to learn how to learn." But then a neighbor had pity on me and brouht an old guitar with a broken neck. The guitar came from a french forced worker, who was assigned to the family and he left it as a parting gift, because he was well treated by her. I glued and screwed the neck back, strung it up with Bergfee strings and the Blues was born . In this time i heard the Rolling Stones, Jimi Hendrix, Ten Years After and Rory Gallagher, like most of the people. (The Stones still played right blues at that time, with Brian Jones. By the way, Jones was the first one which played slide in Enland). I bought a blues sampler one day, still in the 1970's. There was version of Furry Lewis "Goin to Brownsville" on it. I was totally knocked out by his slide guitar playing and his sonorous voice. He is still my idiol. I begun my carpenter's apprenticeship at the age of 18. After the apprenticeship i had worked in the biggest auctioneers of Niedersachsen, at Ahlden Castle. I was 24 years old at this time. But after 2 years i got homesick and returned to the Palatine woods. Since 1982 i worked as a furniture restorer and antique dealer autonomously. I was fascinated particularly, by the field recordings of Alan Lomax and by blues researchers like David Evans or George Mitchell. They did their recordings with tape recorders in the southeren United States. I love this rural blues whicxh was played on guitars and like to performed it myself. I love warm, singing sound which i could not find on any available commercial metal resonator guitar. So i came up with the idea to convert old guitars into resonator guitars. I did this in 1999 first and converted an old Höfner guitar. The result was great and so i stopped playing my metal resonator guitar, which remained in the case from this point. Now I have my dream job. I love to awaken these old babies from their slumber and to give them with new "resonator life". It is pretty cool and always exciting. Besides the many experiences and mistakes that I have made throughout the years with the guitars, it's probably the age of the wood in connection with the resonator which causes the marvelous sound. 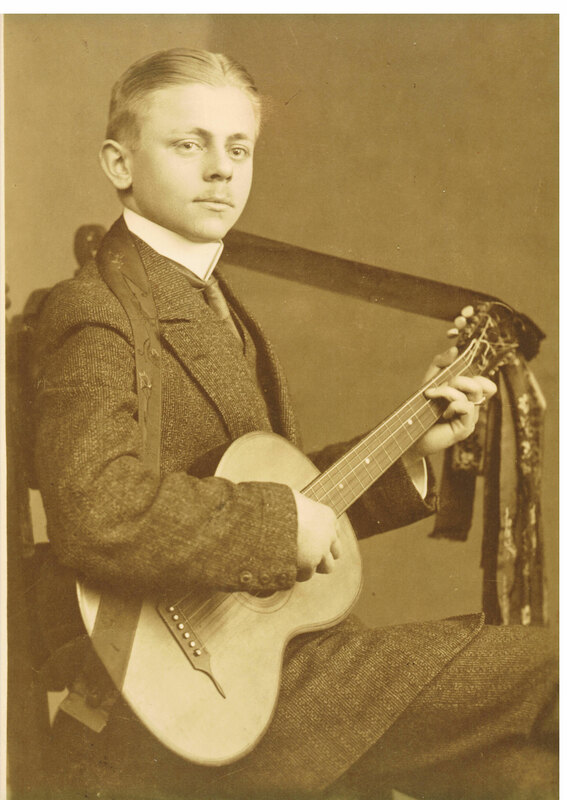 My Grandfather Walter Germer 1891-1983 didn´t play the Blues, but I m sure he would like my Guitars too.